It’s a wonder that this week’s song was ever a hit at all given what people thought about it when it first surfaced. 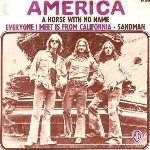 The song in question is America’s 1971 hit A Horse with No Name. On the face of it, it makes no sense at all and people, as they do, jumped to conclusions, the most popular being that it was about drugs because, in the States, ‘horse’ is a slang term for heroin and thus many radio stations refused to play it. America were a trio comprising multi vocalists and musicians Dewey Bunnell, Dan Peek and Gerry Beckley. They were so named because all of them are sons of American military personnel who were based in the UK when they met at the Central High School in Bushey Park. The school was predominantly for children from military family backgrounds. They all had a love of music and first played together as a five-piece called Daze. Gerry began learning piano when he was three and, as a teenager he learned bass and started playing in school bands at the age of 15. As late teenagers they came together as an acoustic trio and auditioned for a concert promoter called Jeff Dexter who placed bands at the Roundhouse in London. Jeff had a songwriter and record producer friend called Ian Samwell at Warner Brothers, he was the same man who wrote Cliff Richard’s debut hit, Move It, and signed them to the label. He asked the band to come up with some songs especially ones that would break them on the radio. The band went into Morgan Sound Studios (where Beckley had played bass on demo sessions a few years before) to record some tracks, with Samwell producing and Kim Haworth who was brought in on drums. The first was an enigmatic Bunnell number with a catchy rhythm that was initially called Desert Song, but at Samwell’s suggestion it was retitled A Horse with No Name. The song aroused some controversy at the time because of its resemblance to Neil Young. What did Bunnell think about that? “I know that virtually everyone, on first hearing it, assumed it was Neil and I never fully shied away from the fact that I was inspired by him. I think it’s in the structure of the song as much as in the tone of his voice. It did hurt a little, because we got some pretty bad backlash. I’ve always attributed it more to people protecting their own heroes more than attacking me.” Coincidentally perhaps, but A Horse With No Name, which spent three weeks at number one in America, knocked off Neil Young’s Heart Of Gold. The song reached number three in the UK. America’s follow-up in the UK was Ventura Highway, which was far more melodic but only reached number 43. Their third and final hit came 10 years in the shape of You Can Do Magic, which, again, despite a fair amount of airplay, only reached number 59. In the States they amassed 19 hit singles and even managed another number one in 1975 with Sister Golden Hair which was produced by George Martin. In 1972 they relocated back to America. Peek left the band in 1976 and the remaining members decided to continue as a duo. Peek eventually died in July 2011. Bunnell and Beckley continue to record and tour to this day and their last album was called Back Pages which was recorded in London in 2011 and featured a special guest appearance by Mark Knopfler.